Bill Ricchini’s Ordinary time is an example of an artist who rolled the dice for instant success and failed. It is a shame since this album deserved a much larger audience than it received. Originally associated with West Philly’s Red Square and its Boyracer sponsored label, Bill Ricchini would’ve been better off here than signing to a misguided subsidiary of heavy metal label Megaforce entitled Transdreamer records. Red Square released tracks by obscure, but talented acts like Boyracer, the Cannanes, Rocketship, Beatnik Filmstars and the Snow Fairies. Instead he bailed for nationwide distribution for an album whose appeal wasn’t designed for mass consumption. Ordinary Time is a flawed album, but one that has some transcendent moments as well. It isn’t hard to see why a label would be willing to bank on Ricchini’s homespun attempt to reconcile Pet Sounds, Brit-Pop and twee. The problem is that you really must be a bedroom genius to pull such a combo off and Ricchini was nothing of the sort. This sounds harsh, but it because I sort of knew the guy and and always felt that this album was unfocused, but kind of amazing. He pissed some folks off by bailing on Red Square for larger distribution and aimed high without really developing his sound further. He would have been better off on an established indie like K records or something smaller since there are a handful of classic indie-pop songs on here. Ricchini draws from a dried-up well of the Zombies, Felt, Beach Boys and George Harrison, but creates magic from humble beginnings. 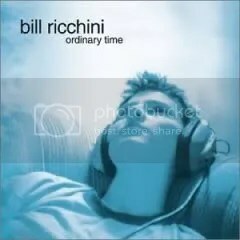 Ricchini’s voice is familiar and soothing and his expressions of alienation and longing are delivered in the bittersweet way that the material demands. Why in the hell am I arguing for this album when I describe it as a mere 60s influenced pop album? Well, it is because half of this album stands as the best indie-pop of the past five years. I also find it tragic that these songs have gone unheard when another label could have made them more popular. Sometimes less is more.